Japanese Encephalitis (JE) is commonly known as Brain fever. 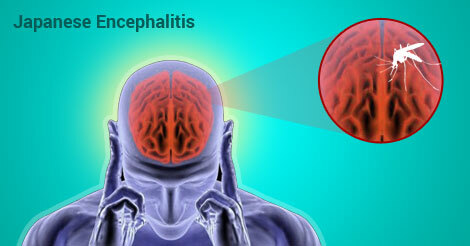 The word Encephalitis means inflammation of brain. The first cases of this disease in the world were recorded way back in 1870s in Japan and hence its name – the Japanese Encephalitis. JE is a communicable disease of public health importance because it often occurs in epidemic form resulting in deaths or permanent brain damage among the affected individuals. JE is a viral disease occuring mainly in rural & peri urban areas. The virus belong to the family Flaviviridae (formerly known as the group B arbovirus) named as Flavivirus mosquitoes, particularly Culex tiritaeniorhynchus breeding in rice fields are major vectors involved in the transmission of disease. The natural cycle involves water birds, including herons and egrets. The culex mosquitoes feed at dusk and prefer pigs and cattle among mammals, bitting human beings only as an alternative. Pigs develop prolonged viremias and function as important amplifying hosts. There is no man – to – man transmission. Man is only an accidental and dead end host. Children below the age 15 are often victims of the disease. The disease manifests with high grade fever, convulsions leading to coma etc. sometimes leading to death. Case fatality is around 20 to 40 percent. The problem of JE is amenable for mitigation through effective implementation of integrated prevention and control measures. It is a newly recognised viral disease/febrile illness of public health importance. It is reported from many parts of Nagpur Region during 2003. A new virus found in clinical samples was named as Chandipura Virus after the locality from which the samples were collected.